Every once in a while, in this line of work, you get a genuinely welcome and unexpected surprise. That’s what happened the other night when I met up with some local tech guys and a certain Steve Mutinda showed up just happening to mention that he did some J2ME programming. He has created two mobile phone apps (and working on a third), which I’ll review over a couple of posts. 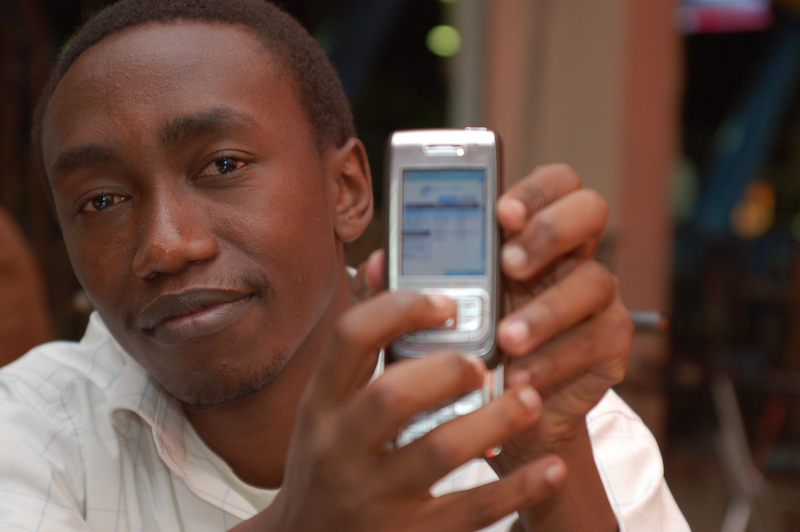 In brief, LiveQuotes let’s you track the Nairobi Stock Exchange (NSE) from your GPRS enabled phone. The NSE updates their data every time a trade happens, and that information can be downloaded as a CSV. Steve has it setup so that he checks it every minute, allowing you to have near real-time access to the exchange, and a scrolling ticker for your selected portfolio. Want to see how your stock has done over time? No problem, there is a basic line chart showing how your shares have done historically. Steve started this about 3 months ago, soft-launching it to a few friends as he worked on new features and fixed things up. So far there are 200 users. I would expect that to change soon. 800,000 Kenyans have just bought into the Safaricom IPO was his inspiration, and a good one because it means there are hundreds of thousands of new stock owners in Kenya. While it’s fee right now, plans are to charge 30/= Kenya Shillings per week ($0.50 cents) per user. Anyone can receive the application through a simple SMS with a link to the URL, and then registering on the spot. Safaricom or Celtel (depending on which carrier the end user has) will act as middleman for transactions, paying Steve on a monthly basis. A little math will tell you that by getting just 10,000 users he will make about 300,000/= per week ($4,665). $18,000/month is a nice salary by almost anyone’s standards. I’ll be asking for a loan from him soon, I hope. What else is in the future? Uganda and Tanzania for one, possibly the rest of Africa if things go well. On the technology side, look for some type of API that will allow others to access the same pre-parsed information. Between this and Jimmy’s DIY lights, I am genuinely excited, the entrepreneurial and innovative fire is truly alive and well in Africa. All we need is to find a way to harness it so that it benefits the collective good as well as the individual good. i was introduced to livequotes yesterday.I dont care about stocks but the way it works was exciting!! !We need more J2ME applications!!!!!!! I also care nothing for stocks, but the app is awesome. And yes we need more of them. I havent acquired one yet but I sure hope to get a copy at the Barcamp 08. It would be lovely if the app could display current forex rates also. Many are the times I have to check the newspaper or some website to see the value in KShs. of some thingy I have seen on the net. Too often, especially around the Skunkworks crowd, I come across such amazing innovations. I always wonder what becomes of them. And then I hear that some Multi-National has graciously (pah!) taken the entrepreneur on board and that story ends there. The innovation is seen as a proof of ability. What is stopping him from a full launch? Has he done a business plan? How can he be assisted? You better patent it before the Japanese grab it and make it theirs just the way they grabbed the ciondos (or kiondos) and the British have snatched the kikoy as well or will soon grab it!!!! Kenyans are favored by God just remember to watch out and protect your innovations! And, a BIG congratulations to you Steve!!! You make me PROUD!!!! we do have a wealth of ideas and talent to match! Great idea Steve. Keep it up. On the issue of patenting,there were many ideas flying aroung at barcamp. anyone think of protecting their ideas?initially there is excitement but when the IT bug hit kenya there will be vultures and hyenas.any ideas anyone? what number does one send the sms to for registration?? wow… this application is out of this world…great job man.. Damn! I wish I could split myself into 5 guys, one would be doing this. Seriously, well done Steve, usiogope! I agree with aMERUcan, is there are place where one can patent bila issues an application like this? steve, what Al Kags is saying is the hard part, “how to milk the cow while drinking the milk” plan. This is really cool. Please forgive me, I have used his photo for the NY Times article today on Kenya. Thanks. great great app, i feel inspired. What became of this innovative idea?